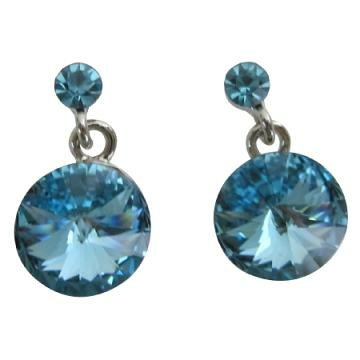 The aquamarine crystals pair of surgical post earrings can be an ideal day or evening wear. Its lustre can brighten up your look. Material Used : Aquamarine crystal round surgical post earrings. Earrings Length : 1/2 inch long. This item in Bridal Accessories category was first added to our catalog on 12-07-2013. Buy Aquamarine Round Stud Earrings, The Power of Love, sold & shipped by Fashion Jewelry For Everyone where you can shop online for Leading Online Retailer for Indian Fashion Jewelry. This Bridal collection has been tagged as valentine gift, holiday gift set, fashion jewelry.